Most people visit the Château de Versailles as a day trip from nearby Paris. If you can make two day trips, that’s even better, and if you want to stay in Versailles overnight, you could do that too. While one day can give you an idea of just how magnificent Versailles is, if you can take two days, you’ll experience much more. Versailles was built by Louis XIV as a getaway from busy Paris, and as a means to keep the nobility more closely under his control. Formerly a hunting lodge, construction of the château began in 1664 and continued until Louis XIV’s death in 1715. The stunningly magnificent gardens were created from surrounding swamp land, and the hydraulics used to create the fountains were and still are a remarkable feat of engineering. The palace was never meant as a home, but rather as an integrated headquarters of every arm of the state in an era where nearly everything stood on ceremony. After Louis XIV died, Versailles was abandoned for a few years, and Louis XV returned there in 1722, where the palace remained the royal residence until the 1789 Revolution. During the Revolution, the furniture from Versailles was sold, and priceless works of art were sent to the Louvre. 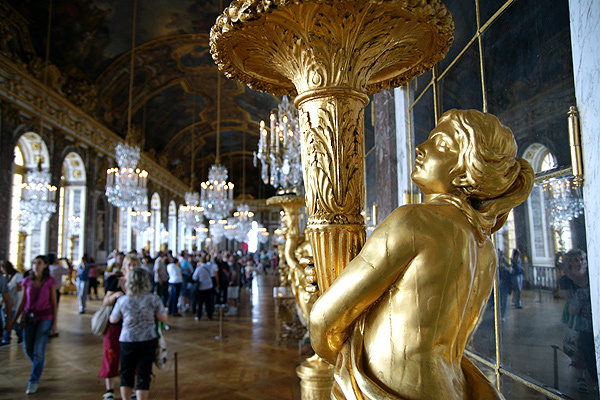 Visiting Versailles is like visiting a small, opulent town. The garden façade alone is 575 meters long (one-third of a mile), and the park ranges several kilometres in both length and width. The state apartments of the king and queen, as well as the Hall of Mirrors can be visited on your own, but much of the rest of the palace can be toured in guided groups that embark at specific times. Expect long lines, particularly on Sundays when the entrance fee is reduced. One of the reasons to visit Versailles on two days rather than one is that the tours of Mme du Barry’s apartments and the apartments of the Dauphin and Dauphine take place at the same time, and it would be a shame to have to choose. You’ll also want ample time to stroll the park, including the Queen’s Hamlet. Marie-Antoinette ordered construction of her hamlet in 1783 as a retreat from the world of the Court. This was a place for the Queen and her ladies to enjoy country life and it included vegetable gardens, livestock, and 11 houses built around a lake, four of them reserved for the peasants who worked the farm. The Queen’s Hamlet was designed to look like a Norman village. The Chateau is closed on Mondays, and the best way to get there from Paris is to take the RER C line to the Versailles-Rive Gauche station. Only trains whose name begins with “V” or number C5 stop at this station. From there it is an easy walk to the Palace. You can catch the C5 line in central Paris at Pont de l’Alma, Invalides, St-Michel-Notre Dame, Champ de Mars-Tour Eiffel, and several other Metro stations. Pushchairs and prams are not allowed in Versailles, and babies under age one must be carried in slings.